When Jesus asks a group of Jewish leaders this question, he aims not only to test their Scripture memory but also their reading strategy. After they correctly answer that the Christ is the son of David, Jesus proceeds with a textual question about Psalm 110: “How is it then that David, in the Spirit, calls him Lord . . . If then David calls him Lord, how is he his son?” Jesus’ simple question about the identity of the person speaking and the one being spoken about in this text stumps the Pharisees, and this type of interpretive riddle has left plenty of readers silent since that day in Jerusalem (see Matt 22:41-46). In The Birth of the Trinity, Matthew Bates argues that the intertextual question Jesus poses in Matthew 22 relates to an area of study freighted with theological significance. In particular, Bates argues that by grappling with just these types of Old Testament texts, New Testament writers and theologians in the earliest church gave shape to the basic contours of the doctrine of the Trinity. Bates teaches at Quincy University, and this volume extends and applies some of the broad hermeneutical proposals Bates develops in The Hermeneutics of the Apostolic Proclamation (Oxford: Oxford University Press, 2012). The path Bates leads readers down involves four significant steps. 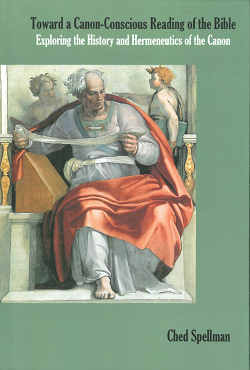 First, he demonstrates that key theologians of the early church such as Justin Martyr and Irenaeus utilized a “person-centered” reading strategy in their attempt to understand the nature of strategic instances of divine discourse in the Old Testament. Accordingly, the second step Bates takes is to show how these early church leaders connected this person-centered reading strategy to the most central developments of the doctrine of the Trinity. 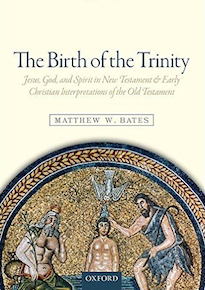 Bates’s thesis is that “a specific ancient reading technique, best termed prosopological exegesis, that is evidenced in the New Testament and other early Christian writings was irreducibly essential to the birth of the Trinity” (p. 2). Bates surveys several contemporary “models” for constructing Trinitarian theology (chapter 1), and argues that a neglected approach is the one that emerges in “continuity” with this “prosopological exegesis” (p. 26). The third step Bates makes involves demonstrating the textual and theological payoff of this approach for the conception of the interior life of the Trinity in the earliest church. Bates pursues this ambitious goal in chapters 2-6 of the volume. These five chapters form the heart of the book. Here Bates seeks to provide a “theologically attuned exposition” of Old Testament passages that were understood by later interpreters to be instances of divine dialogue (p. 7). The picture that emerges from these texts is not a “philosophically defined Godhead internally differentiated by procession or subordination” but rather “a Father, Son, and Spirit who are characterized by relentless affection and concern for one another” (p. 7). For Bates, “some of the deepest and richest aspects of the interior life of the persons who would later come to be identified as members of the Trinity” are “expressed in the very pages of the New Testament itself” (p. 5). “Surprisingly,” he notes, these instances “have not yet been plumbed” (p. 5). As Bates outlines, the events spoken of in these bits of divine dialogue span the entire history of redemption. Readers are able to hear “divine dialogues from the dawn of time” (chapter 2) as the Son addresses the Father before the foundations of the world (Ps 110, Ps 2). This dialogue also contains “theodramatic strategems” regarding the Son’s incarnational mission in redemptive history (chapter 3), as the Son articulates his motives in carrying out the will of the Father (Ps 40, Isa 42:1-9, 49:1-12). Capturing the climax of redemptive history in the cross of Christ, texts like Ps 22 allow readers to overhear “cross-shaped conversations” (chapter 4) as the Son cries out to the Father during his suffering on earth. Peering further into this dialogue, we hear the Son cling to the hope of rescue (chapter 5) and also reflect with the Father about eventual and ultimate triumph at God’s right hand (chapter 6). In this way, Bates observes, “divine discourse [frames] the whole, from creation to new creation” (p. 174). For each of these instances of divine discourse, Bates examines the Scriptural passages cited, the New Testament context, and also the hermeneutical assumptions involved in making the connection. In his fourth and final step, Bates shifts from the relatively descriptive history of interpretation to contemporary hermeneutics and considers the enduring legacy and legitimacy of prosopological interpretation (chapter 7). He asks, when the earliest church interpreted the Scriptures in a theodramatic way and assigned “various divine persons to explain dialogical shifts,” was this “a good reading of Scripture?” (p. 176). To help answer this question, Bates outlines the presuppositions necessary to employ prosopological exegesis. These include the reality of a divine economy, the divine authorship of the Scriptures, the “unity and plot-arrangement” of the Scriptures, and the possibility of “prophetic participation in the divine economy” (pp. 191-92). Bates also provides a series of controls for the art and science of “good theodramatic” readings of Old Testament passages (see pp. 196-202). Among the most important “prudent but critical” controls is that a theodramatic interpretation be “rooted in genuine sites of dialogical shift, conversation, speech, or address” in an Old Testament passage (p. 196). While Bates does not find every instance of patristic prosopological exegesis equally compelling, he argues that the “character assignments” proposed by those in the earliest church are “plausible if certain presuppositions are granted” (p. 202). Bates concludes his book by urging readers to consider tuning into this theodramatic reading strategy of the earliest Christians and to overhear the dialogue of the “conversational God” that it amplifies (pp. 203-05). For the field of Trinitarian theology, Bates establishes several new lines of textual and theological inquiry to consider in pursuit of a “biblical” theology of the Trinity. For instance, Bates opens up a text-immanent way of placing the focus on “persons” at the center of the Trinitarian logic of the biblical authors (see pp. 175-76). As he summarizes, “in conjunction with early Christian experiences of Jesus and certain philosophical and mediatorial factors, the idea of separate persons in timeless, intimate communion within the Godhead—Father, Son, and Spirit—was especially fostered and nurtured by a specific reading technique that the earliest Christians utilized as they engaged their ancient Jewish Scripture” (p. 3). In other words, it was hermeneutics rather than Hellenism that led to the “consolidation of ‘person language’ to express the three-in-one mystery” (p. 7). In this regard, a lingering question for readers familiar with the broader conversation of Christology is the relationship between Bates’s Christology of Divine Persons and Richard Bauckham’s Christology of Divine Identity. A clear result of Bates’s study is a rejection of “the backward movement Christology schema” (p. 2) of scholars such as James Dunn and Bart Ehrman. Agreeing with those who would argue for an “early high Christology” (e.g., Larry Hurtado), Bates contends that the presence of prosopological exegesis within the New Testament and among the readers of the earliest Christian church rules out this retrospective approach to Christology. Beyond these distinctions, though, the relationship between Bates and Bauckham seems at once closer and more nuanced. Bates distances himself from Bauckham at a few key points, but he also notes several areas of overlap throughout his exegetical analysis (e.g., pp. 19-26, 91-92, 100, 203-04). Because of the widespread influence of Bauckham’s Christology of Divine Identity approach and the explanatory power of Bates’s Christology of Divine Persons, further thinking on this particular methodological intersection might be the most challenging and exciting prospect of Bates’s book. My initial suspicion is that Bates’s and Bauckham’s approaches are more like fraternal twins rather than distant cousins. One further aspect along these lines relates to the role of the Spirit. Most of the divine dialogue in the Hebrew Scriptures that the biblical authors note and that Bates and the early church highlight relate to conversations between the Father and the Son. Though Bates notes that at strategic places, it is possible the Spirit is the “person” that speaks in an Old Testament passage, he also argues that in most cases the Spirit’s role is in inspiring the Old Testament author as he provides the “script” of a divine dialogue between the Father and the Son: In these cases, the Spirit “always [supplies] the words” (p. 7). Further reflection on the Spirit’s role in the composition or scripting of these divine conversations would be a helpful complement to Bates’s work. In a relatively brief volume, Bates brings an important aspect of historical theology and patristic research to bear on the theological development of the doctrine of the Trinity. Indeed, because Bates labors to coordinate his study of the compositional strategies of the New Testament writers, the interpretive approach of the earliest church, and the theological logic of Trinitarian discussions, he is able to deliver a refreshing and interdisciplinary work. This volume will be available in paperback at a reduced price ($27.95) in November. Review also forthcoming in JETS (2016).